What is another word for compliment? 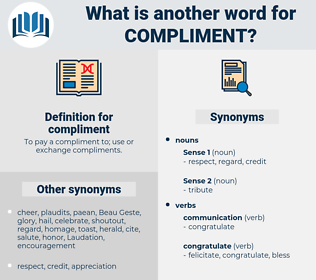 To pay a compliment to; use or exchange compliments. Congratulating, complement, complements, tribute, Commending, complementing, courtesy, acknowledgement, completion, satisfaction. welcoming, Thanking, Applauding, Celebrating, gratifying, offering, Commending, complementing. complement, commend, applaud, thanks, welcome, acknowledge. complement, commend, applaud, welcome, acknowledge, greet, complete. congratulate, commendation, appreciation, congratulation, eulogy, fulfilment, comity, recognition. criticism, condemn, insult, or, <a href="http//chamberscouk/searchxref=02307&amptitle=thes">complement</a>, See panel at. disfavor, dislike, opposition, neglect, libel, disrespect, silence, ignorance, disregard, refusal, veto, complaint. vituperation, abuse, reproach, disapprobation, repudiation, denunciation, gibe, hissing, ignominy, slander, taunt, disapproval, obloquy, vilification, condemnation, epithet, scorn, disparagement, censure, slight, reproof, contempt, animadversion, blame. discourage, dissuade, refuse, dishonor, castigate, forget, disapprove, upset, humiliate, displease, anger, criticize, worry, complain, shame, depress, debase, repel, denounce. I intended goin' anyhow, but him ringin' me up so sudden like, I - My dear, said Mr. Pennycook, he paid you a compliment. The compliment touched a tender point. unction, fulsomeness, smarm, trade-last, flattery.